In this lesson, you will learn about how to use, configure, and apply Intelligence Alerts. How to use Auto Intelligence Events. How to Configure Custom Intelligence Events. Google Analytics allows you to automatically monitor your data according to set preferences via a feature called Intelligence Events. No user intervention is required to enable this feature. As you can see in the above screenshot, there are three reports available -- Daily, Weekly, Monthly. Also, there is an Overview report showing your main highlights. In the Overview report, you get to look at all of the automatic alerts that have occured during your selected time period. In the screenshot below, you can see all of the alerts that occured in Novemeber and December, along with the importance level of each. There is no user intervention required to enable this feature. The Google Analytics intelligence engine goes through your historical data so that you can go back and review automatic alerts from the past. As you can see in the above example, Google Analytics has flagged an event where Pageviews by visitors coming from to our website from New York has gone up over 60% in November. 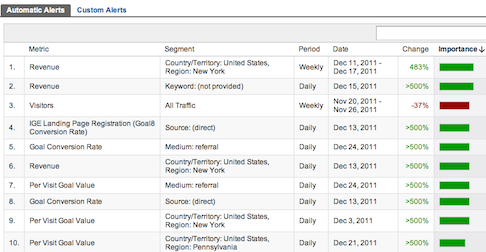 You can also sort all the alerts based on either dimensions or metrics by simply clicking on the Metric/Dimension tab. In the following screenshot you can see that location. You can manage alert sensitivity by simply moving the Automatic Alert Importance slider between high and low settings. High Sensitivity settings will allow you to see all the alerts that Google Analytics created and the low sensitivity settings will display only the most significant alerts. The custom alert function allows you to tell Google Analytics what to watch for and Google Analytics will generate an alert when that particular event occurs. To create a custom alert, first click on the Overview report, the Custom Alerts tab, and then the Manage Custom Alerts button. You are then brought to the following screenshot. The example alert shown in the above example will generate an alert when incoming traffic coming from Google increases over a weekly period. You are running an online marketing ad which directs people to a particular webpage on your website. 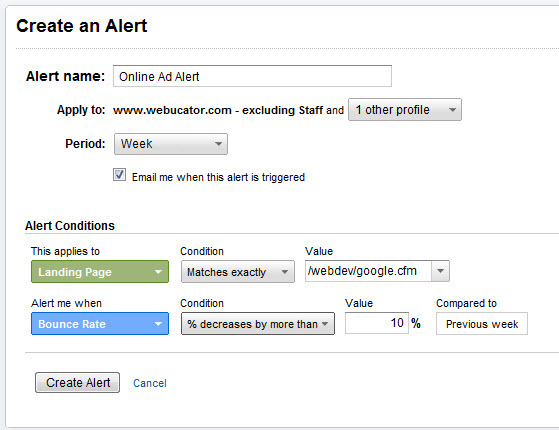 Set up an custom alert to monitor the bounce rate for the particular landing page associated with your online ad. Assume that your online ad directs you to the /webdev/google.cfm page on your website. Also, set the criteria for bounce rate to be more than a 10% increase.